This is the popular access to "The Wave". From the Wire Pass TH, walk 0.5 miles downstream along the wash until you get to a sign indicating "Buckskin Gulch/Coyote Buttes". The trail to the Wave will veer of to the right out of the wash and up a steady incline. At the top of the ridge, the path turns South and levels off heading towards a butte. You will pass a trail register box indicating "Special Permit Required". Link to permit info is in the driving section. At about mile 1.0, the trail ends after crossing a wash. Head East over a low divide on a slick rock ridge. Note that there is no Cairns. I'm told that Rangers remove any they find. About 150 ft after you cross through a small pass, head South along the East side of Coyote Butte. At about mile 2.0 you will encounter the famous Wave. BLM Division Reports Reservations, permits, and advance payment of fees are required for Coyote Buttes. A separate reservation and fee payment must be made for each day requested. Visitors must display the permit receipt on outside of packs while hiking. A link to permit details is found further down the page near directions. From Page, go North and West on Hwy 89 about 30 miles. Just as Hwy 89 cuts through the Cockscomb between mile marker 25 and 26, turn South on House Rock Valley Road. 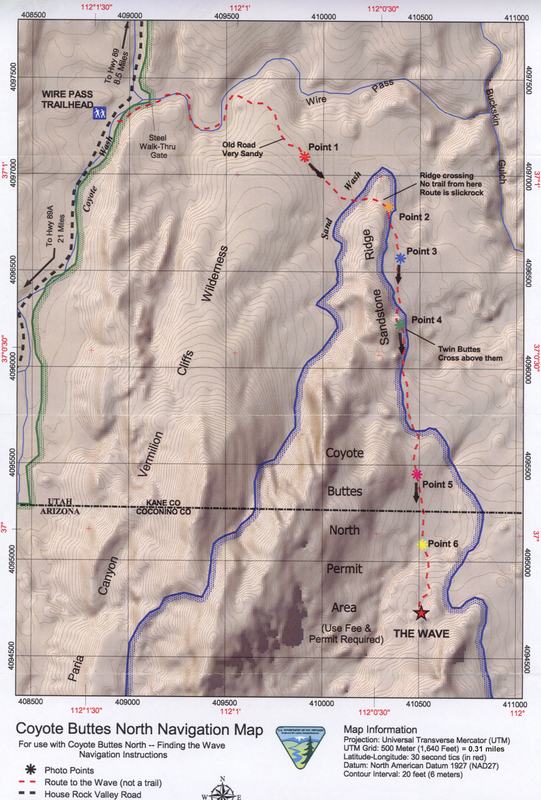 Travel about 8.5 miles South until you reach the Wire Pass Trail Head for Coyote Buttes North and the Wave. Note that you are in Utah, near the Arizona border. 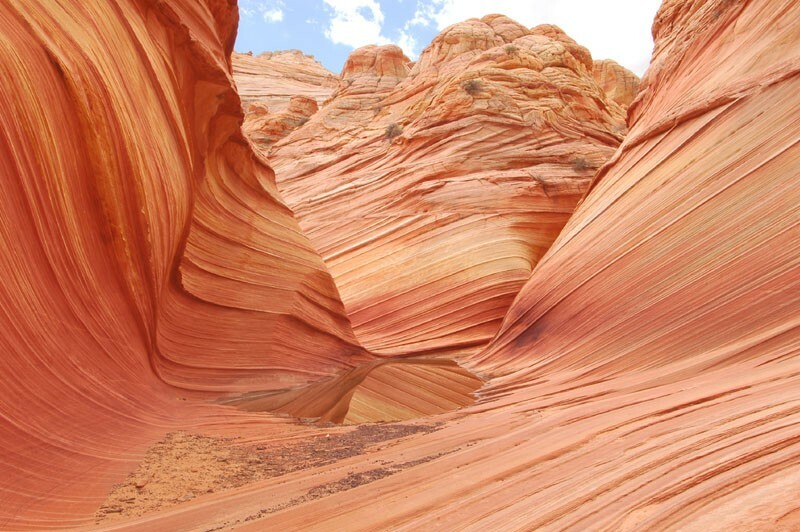 The Wave is located in Arizona. 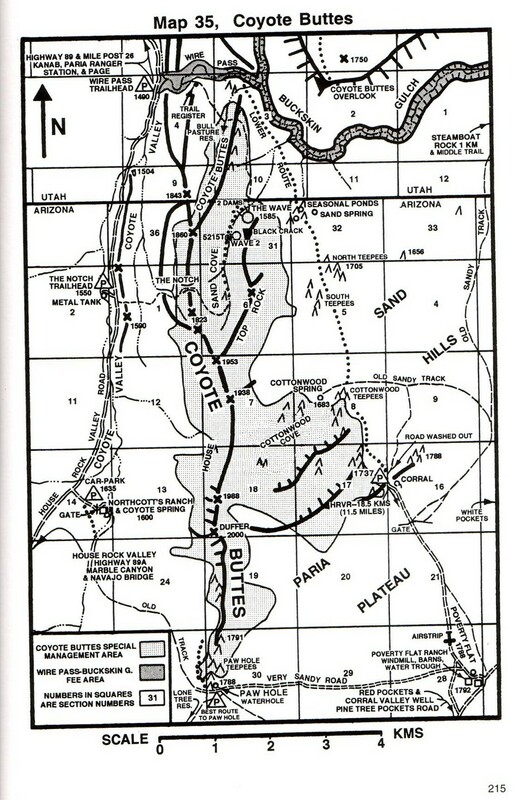 For Coyote Buttes South and the Teepee's, travel 16.1 miles South from Hwy 89 until you reach the Lone Tree Reservoir/Lower Paw Hole Junction. There are no signs, but half a dozen culverts are piled on the East side of the intersection. It is HIGHLY ADVISED to park your vehicle here and hike Lower Paw Hole Road to Paw Hole. Lower Paw Hole Road is EXTREMELY SANDY. Note that you are in Arizona, near the Utah border. Just before Hwy 89 mile marker 21, on the South side, you can find the Paria Ranger Station & Visitor Center. 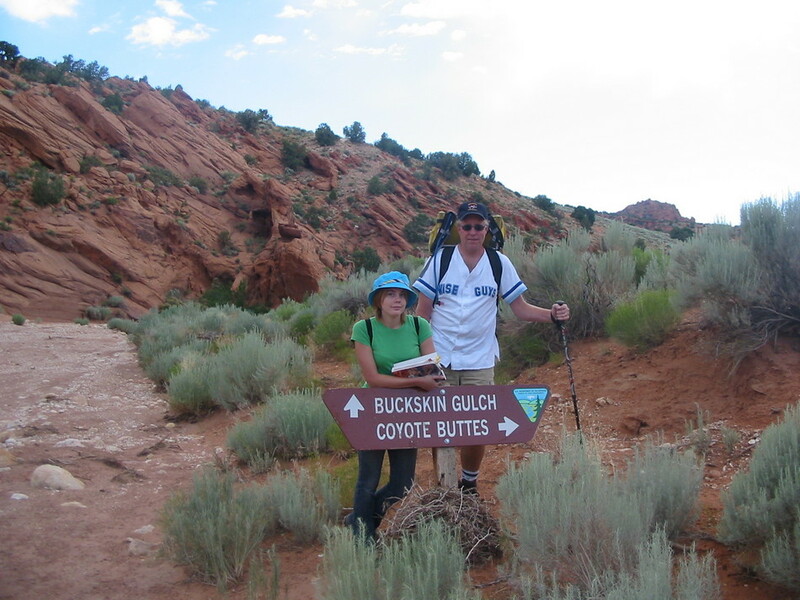 The Visitor Center has made a Coyote Buttes map available to hikers.